Aboard Odyssey, Mitchell, Carter, Daniel, and Vala watch the shimmering city of Atlantis come into view below them. They have come to the home of the Ancients on an urgent mission, to prevent the Ori from sending more ships through the supergate, and to find the location of Merlin's weapon. Dr. McKay joins Mitchell and Carter aboard Odyssey as they depart for a black hole in the Pegasus galaxy, hoping to establish a wormhole that will jump to the supergate in the Milky Way where Teal'c is waiting with a secondary gate. Meanwhile, Daniel and Vala hope that the secret to Merlin's weapon lies in Atlantis's Ancient database. 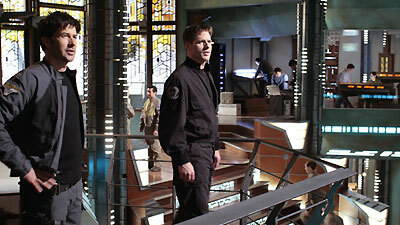 Daniel and Vala access the holographic avatar of the Ancient library to begin their meticulous search, but Daniel's suspicions grow when the hologram immediately offers the names of the planets they seek, then turns to address Daniel directly before vanishing in the ethereal glow of an ascended being. The image returns in response to Daniel's impassioned plea for an alliance against the Ori, but the being is Morgan Le Fay herself, an ascended Ancient who risks breaking the Ancients' highest law by interfering in the affairs of humans. She can only offer the warning, "Merlin's weapon is not…" before she is drawn away by the Others. Odyssey releases a stargate near the black hole and opens a connection to the secondary gate, but twice their attempts to aim a warhead at the gate fail to force the wormhole to jump. Suddenly, an Ori ship arrives at the supergate, while in Pegasus a Wraith hive ship fires at Odyssey. In a final desperate attempt, Odyssey slingshots around the black hole and beams the warheads aboard the Wraith ship. The explosion destroys the ship, and causes the wormhole to arc. As the massive supergate activates, the Ori ship is annihilated in the developing kawoosh. A great victory has been achieved this day, but it is clear that we are in this battle alone. Praclarush Taonas was one of the earliest Lantian cities. It was abandoned when the inhabitants learned their sun was nearing the end of its life. Merlin/Myrddin was among the Lantian citizens who fled to Earth from Atlantis, known then as Moros, the last High Councilor of Atlantis. Morgan Le Fay is an ascended Ancient. Her name in Ancient is Ganos Lal. When the Ancients first abandoned Atlantis millennia ago, Earth was harsh and the people primitive. There was no hope of living among them as Lantians or rebuilding Lantian society, so instead they spread out to many lands, some planting a few small seeds of civilization among the first tribes of man, others making their way to the stargate in Antarctica, others choosing to live the remainder of their lives in seclusions and meditation. Both Merlin and Morgan chose seclusion and meditation, and eventually ascended. Thousands of years later, seeing the threat the Ori could one day become, Merlin retook his human form in order to create his weapon to defeat them. He did everything within his power to keep his work secret, but the Others feared his intentions and Morgan was sent to observe, and if necessary to stop him. For that brief time in Earth history, Merlin was the most powerful being on Earth, and he created a small enclave of noblemen with whom he entrusted his secret: Arthur and his knights of Camelot. Merlin broke the Ancient's highest laws by retaining all of the knowledge and powers he had gained when he ascended and using that knowledge as a human to create a weapon capable of wiping ascended beings from existence. The diameter of a stargate is not arbitrary. There is a specific correlation between the energy required to create a stable wormhole and the size of the gate, with the energy exponentially proportional to the size. By dialing out from Pegasus to the Milky Way and causing the wormhole to arc from the Milky Way stargate to the supergate, the supergate is now connected to a wormhole powered on the other end by a black hole and can remain active almost indefinitely, preventing the Ori from dialing in.